Liverpool manager Brendan Rodgers says Luis Suarez's admission of diving is "unacceptable" and he will be dealt with "internally" by the club. The 25-year-old striker admitted "falling" to win a penalty when Liverpool faced Stoke in October in an interview with Fox Sports Argentina. 1 October 2011: Everton's Jack Rodwell is sent off in the Merseyside derby despite appearing to win the ball in a challenge on Suarez (pictured). 7 October 2012: Stoke manager Tony Pulis accuses Suarez of diving in 0-0 draw at Anfield. 8 October 2012: Brendan Rodgers defends Suarez, saying "the vilification of Luis is both wrong and unfair". 28 October 2012: Suarez celebrates his goal in the Merseyside derby with a swallow dive in front of David Moyes, who had accused Suarez of diving when Rodwell was sent off in 2011. 16 January 2013: Suarez admits to "falling" to try to win a penalty against Stoke to Fox Sports Argentina. 17 January 2013: Rodgers says Suarez's admission of diving is "unacceptable" and he will be dealt with "internally". Rodgers revealed the club would take action against the Uruguayan. "I think it's wrong. It's unacceptable. I've spoken to Luis and it will be dealt with internally," he said. "Diving is not something we advocate. Our ethics are correct. "He has been totally understanding on where I am coming from as manager of the club," Rodgers continued. "This is a big club and, whatever people do say goes around the world, and what was said was wrong and not acceptable. There is no-one bigger than the club or the club's image." He added diving was "not something we associate with as a club of this standing". 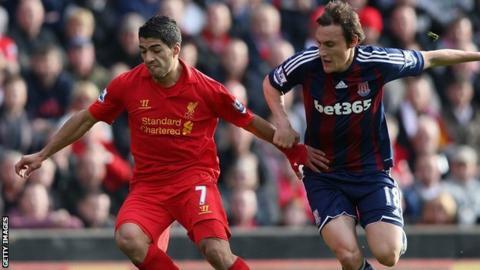 Suarez's admission was in relation to Liverpool's goalless draw with Stoke, where he was criticised by Potters manager Tony Pulis after the game. Pulis called for stronger action on diving when asked about Suarez in light of Rodgers' comments. "They should look at it on a Monday after the games have been played at the weekend, and people who have been caught simulating should be punished. "I think if you do that - if you give them three, four or five games or whatever - then it will take it out of the game. "With simulation, I think if a player is found blatantly diving to gain an advantage, whether it is a penalty or conning a referee into giving a decision, they should be dealt with very severely. "What you would find is that it would soon stop, and that is what we all want, because it is, on a lot of occasions, cheating." Fifa vice-president Jim Boyce also got involved shortly after the incident against Stoke, saying diving was a cancer that was ruining the sport. Before Suarez's admission, Rodgers had previously defended the striker over the matter, saying "vilification of Luis is both wrong and unfair". But on Wednesday, Suarez said: "I was accused of falling inside the box in a match, and it's true I did it that time, because we were drawing against Stoke at home and we needed anything to win it. "But after that everybody jumped out to talk - the Stoke coach and the Everton coach [David Moyes] - but the name Suarez sells [papers]." Rodgers is hoping the admission will not affect officials' opinions of Liverpool and hinder their chances of getting future penalties. The Liverpool boss said: "My main concern is the team. As long as it doesn't affect our chances - we've only had one penalty this year anyway - but as long as it doesn't damage our prospects in the future that is the most important issue. "Anything that is detrimental towards that is something I don't take too lightly and, if that is something I think affects it, that [chat with Suarez] was a clear message." Suarez also revealed he felt he was treated harshly following his handball in Liverpool's 2-1 win over Mansfield earlier this month. The striker handled the ball before scoring what turned out to be the crucial goal in the FA Cup third-round tie. "The other day a ball hit my hand with no intention at all, and everybody criticised me because I kissed my wrist," he added.